My Creative Existence: Skywatch Friday - 17th December 2010. It's been a while since I've played along at Skywatch Friday! 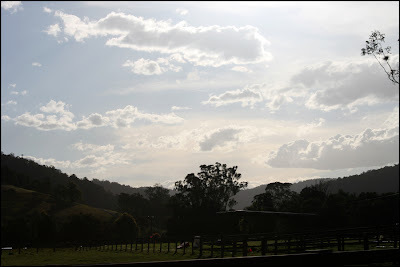 The photo I am sharing today was taken back on the 18th September whilst driving through the rural area of Yarramalong on the Central Coast of NSW, Australia. (Click to enlarge). The sun was just above the top of the photo, on it's way down for the afternoon. What's so impressive about this photo is that I took it from the passenger side window of our car while it was moving at normal speed! (Don't worry - I was the passenger! LOL!). For more photos of beautiful skies around the world, check out Skywatch Friday. Ah, warm an sunny Australia. That is the downside of viewing pictures from around the world.